Usually when I first encounter a game, there is a particular element that draws me to it. Be it the plot or the mechanics, there is always something that really resonates with me. For Dischan’s Dysfunctional Systems: Learning to Manage Chaos, it was absolutely the artwork. And as I delved deeper into the game, I also found an excellent plot, great characters, and a fantastic soundtrack. Dysfunctional Systems: Learning to Manage Chaos is the first episode in a longer series, although more episodes have yet to be released (more on that later). 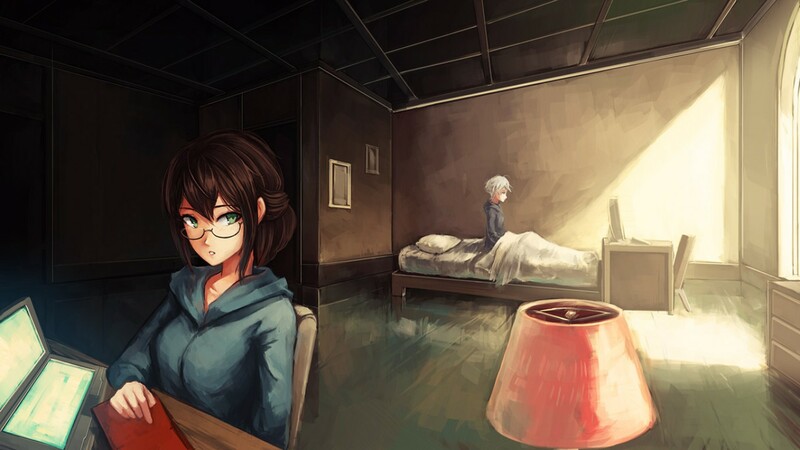 I would describe it as the first “proper” visual novel I’ve ever played. 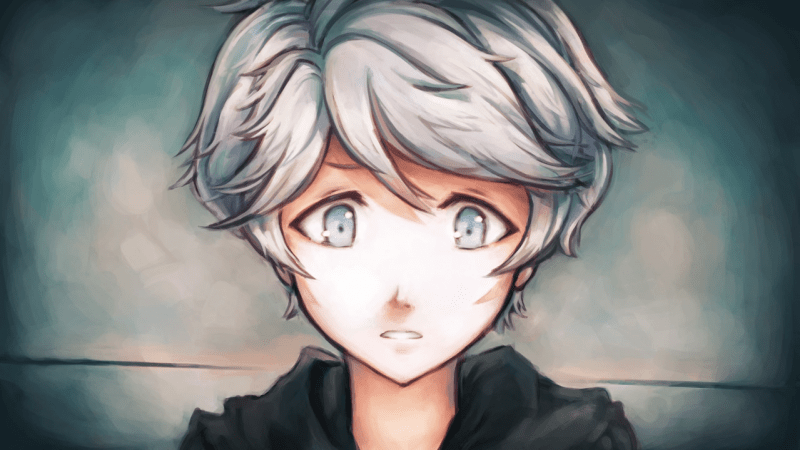 My experience with the genre has been with games like the Ace Attorney and Zero Escape series where there is another level of interactivity beyond just reading the story and making dialogue decisions. Dysfunctional Systems focuses completely on the story, and offers the player only a few choices along the way, although some of them are ultimately pivotal to the direction the plot takes. Although I wouldn’t want every game I play to be a visual novel, I’m ready to sometimes give up interactivity and just watch the story unfold. It does give the writers a chance to tell a more cohesive story. But if you’re not one for interactive fiction or text-heavy games, then the visual novel genre, and by extension Dysfunctional Systems, is probably not right for you. The citizens of Brighton struggle with intense poverty. So let’s cut to the chase. What the heck is the game about? Dysfunctional Systems is centered around the life of fourteen-year-old Winter Harrison, a mediator in training. In Winter’s “utopian” world, it is the job of mediators to travel to other less fortunate worlds which have fallen into chaos, and ultimately restore order. There are all kinds of different worlds out there, some more alien than others (there is some discussion of magic worlds and worlds with malleable physics). In the first episode, Winter is shadowing her mentor Cyrus Addington on her second ever mediation. She finds herself in a world called Sule, which is not dissimilar from our own. It is up to Winter and Cyrus to mediate the country of Brighton, which finds itself in severe poverty. Although Brighton has recently gained independence from Gabrea, their wealthy colonizers, they remain the “workhorse” of Gabrea, and Brighton’s citizens are being quite literally worked to death. They are forced to work multiple jobs and celebrate wage increases of only a few cents, and millions of Brighton’s residents die of poverty and starvation. I will admit that while I did not find myself immediately engaged by the interactions between Winter and Cyrus, the game really sucked me in when it began to deal with Brighton and its citizens. Cyrus attempts to convey the gravity of the situation. Shortly after Winter and Cyrus arrive in Brighton, however, the situation quickly becomes a ticking time bomb. The president of Brighton lays out a list of demands which Gabrea must meet within four hours, or Brighton will launch a nuclear weapon at one of their major cities. Brighton is the first country to have developed a fusion bomb, and the president sees this as the only way to force Gabrea to comply with their demands. Winter and Cyrus thus find themselves in a situation which must be mediated immediately. However, the two cannot reach an agreement on how this situation should be resolved. Winter struggles with her ignorance. Winter is young and morally stubborn. She clings to a black and white morality and openly scoffs at concepts such as “the needs of the many outweigh the needs of the few”. She is inexperienced with mediation and wants to stick to the textbook methods of conflict resolution. Despite being well-read and clearly very intellectual, Winter is surprisingly naïve. The world from which she originates has given her no experience with war, death, or suffering. Cyrus, on the other hand, does anything but stick to the textbook. He has a reputation among other mediators for carelessness and extreme tactics. He is experienced, disillusioned, and prepared to do what he must to get the job done. He is also an excellent teacher to Winter, truly listening to her and considering her opinions, as well as forcing her to step out of her comfort zone and push away from narrow-minded thinking to make her a better mediator. The two complement each other quite well, and ultimately, it is great to see them in action. 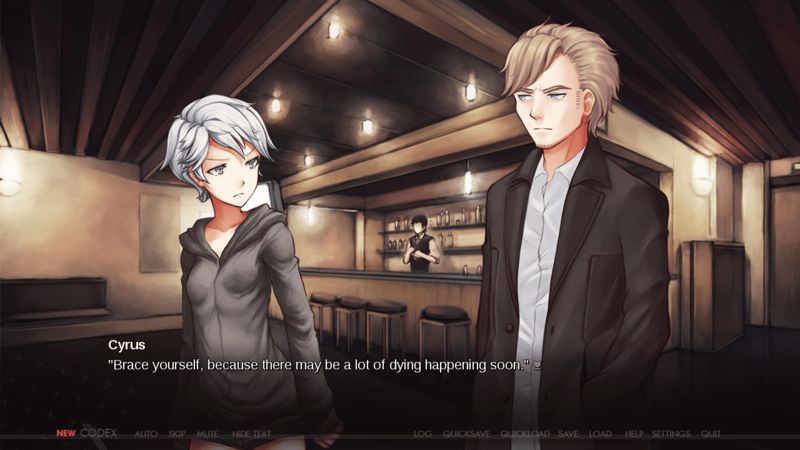 The game also lets us spend some time with Winter after she returns home from her mediation, and introduces the player to a new playable character, Waverly. Playing as Waverly does provide some new perspective, but ultimately does not have an effect on the plot as the player does not get to make any decisions during her segment. 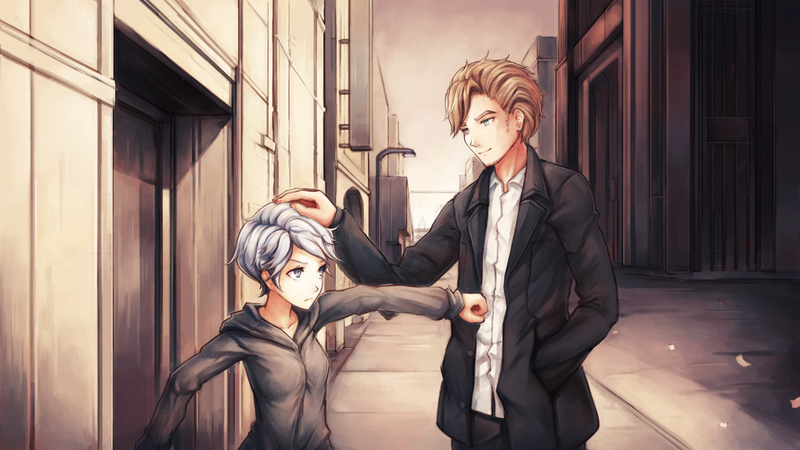 Winter and Cyrus, as well as the other characters introduced in the episode, nicely compliment the intriguing premise and plot of Dysfunctional Systems. As far as I’ve been able to discern, there are two distinct paths the game may ultimately take based on how the player decides to go about the mediation. The two branches are ultimately very different, and a second playthrough is most certainly warranted. 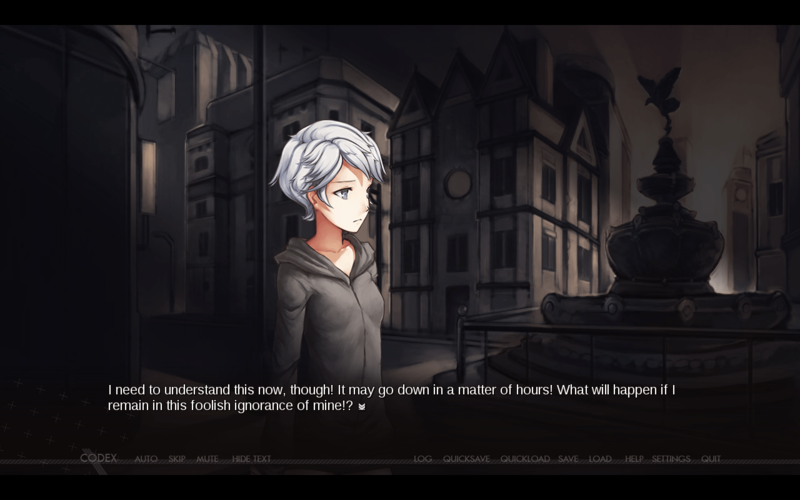 Not only do plot and dialogue options change, the player is also presented with different information, different minor characters, and even different music tracks. Fortunately the game makes experiencing everything easy by allowing you to skip text you’ve already seen in later playthroughs. I would say that it took me about two hours to complete the episode the first time, plus maybe another forty-five minutes to go back and experience the other ending. Due to the importance of decision making and weighing the possible consequences of your actions, I think the ability to see things play out differently based on your choices adds a lot of value to the game. You can see that not only is the mediation of Brighton changed, but so too are the lives of characters. Dysfunctional Systems asks some very interesting questions about the consequence of choice not only on history but on those who are forced to make difficult decisions, as well as the nature of right and wrong and concepts like “the ends justifies the means”. Although I was disappointed with the length of the game, it does beg at least two playthroughs, and is available for a very reasonable price. It is of course only a piece of a larger series. Although the episode is stand-alone in the sense that Winter and Cyrus have finished up in Sule and returned home, it does end on a bit of a cliffhanger in regards to Winter’s future post mediation. The episode also sets up a lot of potential for further exploration of characters, the academy which Winter attends, and, of course, all the other worlds out there that need mediation. It is very clear that Dysfunctional Systems was meant to be an episodic series, and that the first episode is just a taste of what the series has to offer. So overall, despite the fact that the story of Brighton has been wrapped up, the first episode will most certainly leave you wanting more. You can always pop open your codex for more information. 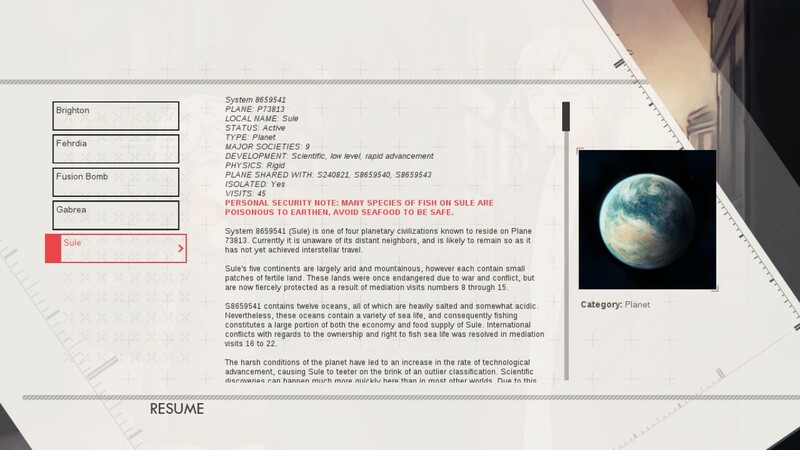 The game has some other nice features that add to the experience including a codex which allows the player to stop and read up on things relevant to the world. And, as mentioned before, the game has some great artwork and a fantastic soundtrack composed by CombatPlayer, who I was awed to learn is completely self-taught. The game ultimately has a very cohesive feeling running through everything from the writing to the artwork to the soundtrack. All this creates a first episode that sets up the makings of a great series. But where are the other episodes you may ask? If you’re anything like me the first episode left you wanting so much more. Since Dischan sold the first episode for a mere $4.99, they were unable to fund the rest of the series. 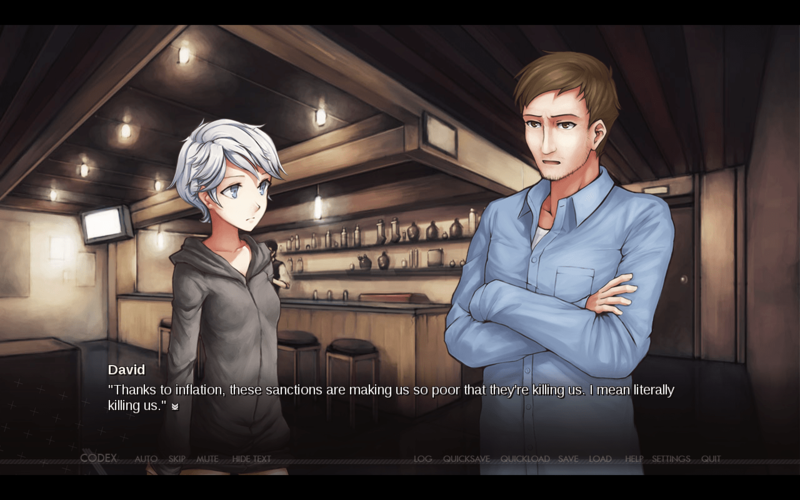 As such, they’ve turned to Kickstarter to fund episodes two and three and give us a conclusion to Winter’s story. If you’re looking for more on this, checkout our Crowdfunding Spotlight on the series. Overall I think that Dysfunctional Systems: Learning to Manage Chaos is a great first step to creating an awesome series. Despite the short length, I would highly recommend this game to anyone who likes visual novels or games with a compelling story, as well as those who can appreciate Dischan’s unique vision.